Home › Uncategorized › It’s Back! 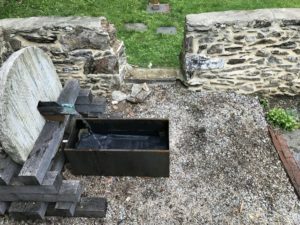 Last year limbs from the huge ash tree at the Rose Valley Heritage Garden and Veterans Memorial fell and crushed the trough that caught the water from the millstone fountain. Apparently Be Prepared is followed by Be Perpetual because Connor McGaffin, the Eagle Scout who worked on the original construction of the Memorial Garden, stepped up and recreated the waterproof trough with the help of his father, Jim McGaffin. This was no small feat as the rusted trough is not waterproof in its original state (or rusted), so Team McGaffin had to recreate a number of steps to get us up and running (literally) again. The Rose Valley Centennial Foundation thanks the McGaffins for their continued contribution to the Magic of Rose Valley.